This book has been divided into four sections. Part One: The Introduction places the position of the Buddhist Tantras within Mahayana Buddhism and recalls their early literary history, especially the Guhyasa-mahatantra; the section also covers Buddhist Genesis and the Tantric tradition as well as the analogical thinking in the Buddhist Tantras. 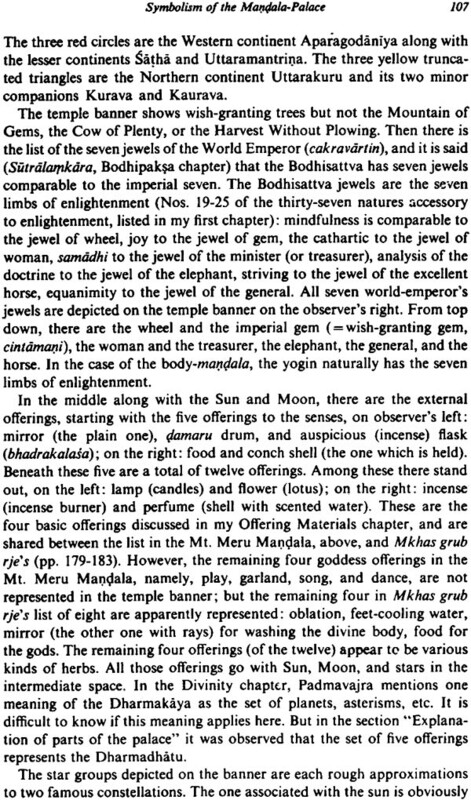 Part Two: The author discusses the foundations of the Buddhist Tantras - he considers the Tantric presentation of divinity; the preparation of disciples and the meaning of initiation; some Tantric materials; symbolism of the mandalapalace; Tantric ritual and the symbolism of its attainments; twilight language and a Tantric song. Part Three: This section is devoted to Special Studies which are very rarely available to the general public, such as the nine orifices of the body and the Tantric teachings of the inner Zodiac; female energy and symbolism in the Buddhist Tantras; and the fivefold ritual symbolism of passion. Part Four: The Bibliographical Research contains a correlation between the tantric portions of the Kanjur and the Tanjur. Alex Wayman, formerly Professor of Sanskrit, Columbia University, New York is in the forefront of Western Buddhist Scholarship by his series of books in both tantric and non-tantric Buddhism based on over thirty years of researches. He employs both the Sanskrit and Tibetan languages in his books and articles. He has authored well over a hundred articles for professional journals and honorary volumes in various countries and in recent years almost exclusively by invitation. His authorship of various seminal works on Buddhist Tantra ensures that the present collection of tantric essays conform to high standards of authoritative texts and dependable citations. The author Alex Wayman here reprints a number of his published Tantra essays and writes some others to fill out his work the Buddhist Tantras. It has much material not readily available elsewhere in Western language sources. 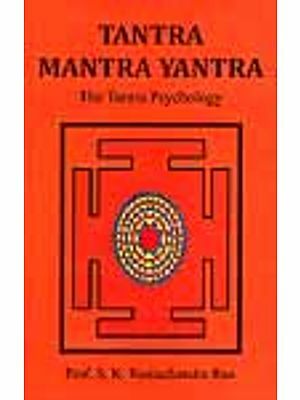 This new material includes such matters as the Tantric theory of divinity classification of offering materials authoritative symbolism of the Mandala palace an explanation of Tantric ritual the Tantric teaching about the body’s nine orifices and the theory of female energy in the Buddhist Tantras. It concludes with the correlation of the two Tantra collections in the Kanjur and exegetical works in the Tanjur. The work is leavened with illustrations and drawings. The author demonstrates here as he does in his other works on the Tantra an at hominess with the Tantric literature and shares with the reader his sympathetic burrowing in these recondite texts. 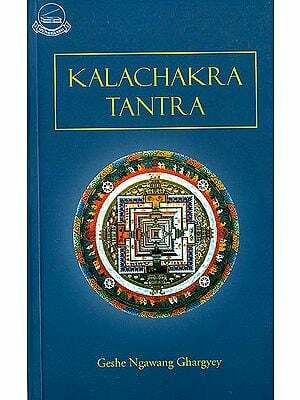 This work is prepared from my previously published articles in the field of the Buddhist Tantra plus new studies especially made to round out the material for a reasonably integrated volume. It has particular contact with two previous books in the Tantric field, Mkhas grub rje’s fundamentals of the Buddhist Tantras translated by F.D. lessing and Alex Wayman which I refer to as Mkhas grub rje’s and my yoga of the Guhyasamajatantra the Arcane lore of forty verses which I refer to as yoga of the Guhyasamajatantra. Mkhas grub rje’s is written by a Tibetan proficient in the Tantra on behalf of his Tibetan disciples. The Yoga of the Guhyasamajatantra is a synthetic commentary based on the Guhyasamajatantra and commentarial literature in that lineage. 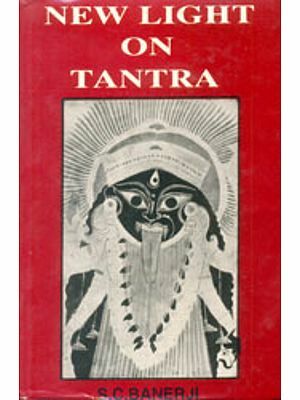 In contrast the present work goes further than the last one named in communicating varied aspects of the Buddhist Tantra to Westerners by researches based on texts sometimes using the Guhyasamajatantra lineage but with special reliance on what are called the lower Tantras and in the case of the fourth or highest class of Tantra with frequent utilization of the Mother Tantra besides by more contact with the living tradition. This is why the present work is mainly different both in content and in organization from my two previous book engagements with the vast Buddhist Tantra literature. I also have under active preparation two other works in this field: Tibetan Miniature paintings based on the Lessing manuscripts which deals with the Buddhist Tantras principally in terms of individual deities and Minor Buddhist Tantra Texts relatively brief but important texts in full translation. All those works whether published or in press or preparation, have a common method which is the subordination of personal opinion about the Tantra to authoritative explanations by the proficient of this cult. Tam pleased to express appreciation to the following journals, publishers, or agents for permission to reprint in whole or part certain articles of mine: Bhandarkar Oriental Research Institute (Poona) (Golden Jubilee Volume) for “Early Literary History of the Buddhist Tantras ..“ Oriens Extremus (Lessing Memorial issue) for “Buddhist Genesis and the Tantric Tradition.” The Tibet Society Bulletin (Bloomington) for “Preparation of Disciples for Evocation of Deities.” Adrien Maisonneuve, II rue St Sulpice Paris (Etudes tibétaines dédiées a Ia mémoire de Marcelle Lalou) for “Symbolism of the Manala Palace.” Institut de Civilisation Indienne, Universitd de Paris (Mélanges d’lndianisme ala mdmoire de Louis Renou) “Concerning samd/rd-bhdsd / samclhi-bh&sd / saqid/ryd bIrasa.” versity of Chicago Press (which holds the copyright) for “Female Energy and Symbolism in the Buddhist Tantras” and portions of “Totemic Beliefs in the Buddhist Tantras” (History of Religions). Koyasan University (Japan) (Studies of Esoteric Buddhism and Tantrism) for “The Fivefold Ritual Symbolism of Passion.” Lokesh Chandra, International Academy of Indian Culture (New Delhi) for “Outline of the Thob Yig Osal bahi Me Lon . “ I have made corrections according to my present knowledge and minor changes for mutual consistency as well as some additions. It is with deep gratitude that I express my indebtedness to Mrs. Margaret Lessing of Berkeley, California, for making available to me the manuscripts of the late Professor Ferdinand D. Lessing, which have furnished some invaluable materials for the present book, especially the photographs and texts he collected for his researches in the iconography and cult of the Lanaist temple of Peking, the Yung-Ho-Kung. These materials account for all the Plates, except for 1, 5, and II. They also furnished models after which the Dharmodaya, Green Tãra, and Buddhaäkini drawings were executed by Mr. Osamu Yoshida. The American Philosophical Society deserves thanks for its support of my travel to India in Spring 1970, which, while not for the express purpose of this book, fortuitously coincided with the Kalacakra ceremony in Dharmsala. My attendance at this important ritual occasion provided some of the living touches which secure a contemporary relevance for ancient Plates 1, 5, and II, are after photographs taken by my wife and myself during that ceremony. There are varied text sources for the studies herein reproduced. Since so much is derived from Tibetan works—the overwhelming extant corpus for the Buddhist Tantra—I should be explicit. There are a number of references here to the Derge Kanjur and Tanjur and native Tibetan works at the University of California, Berkeley, from studies beginning in the early 1950’s. the Tohoku catalogs to which I refer in connection with notes form these sources are described in my article Female Energy. There are also many references by PTT to the Japanese photographic edition of the Peking Tibetan Buddhsit cannon and including Tson-kha-pa’s works. I used this edition after it was purchased by the University of Wisconsin and eventually assembled a large collection of reproduced texts from this edition by the kind access to an excellent duplicating machine of the University Industry Research program Madison Wisconsin. I still make much use of these duplicated texts with the added convenience of being able to make notes on the pages, Tson-kha-pa’s snags rin chen mo in the peking popular blockprint this is this great compendium on the Buddhist Peking popular blockprint this is his great compendium on the Buddhist Tantras. Besides it was necessary to consult some further canonical works to complete the present book and I have accordingly made some use of the Narthang edition of the Kanjur and Tanjur now conveniently accessible at Columbia University. For ease of combining the various published essays with further studies in the present form I usually omit the original texts Sanskrit and Tibetan such as face the Translation of Mkhas grub rje’s and are abundant in Yoga of the Guhyasamajatantra as well as in my various published articles over the past twelve years. These omissions not only facilitate the reading of this book but also allow my transition from a former transcription of Tibetan to the Library of Congress transcription system. In all cases references are given so that persons who wish may consult the original texts. Finally for the mechanics of issuance, I must thank Mr. Donald Weiser for his interest in publishing this book and the expeditious manner of his handling it.